Coleman Namakan Fast-Pitch Dome Tent 5 Person is a freestanding summer camping tent with an easy setup and a price tag which is hard to match. Coleman Namakan Fast-Pitch Dome Tent 5 Person. Fast-pitch: If you are not familiar with this term, they use this design in several of their tents. 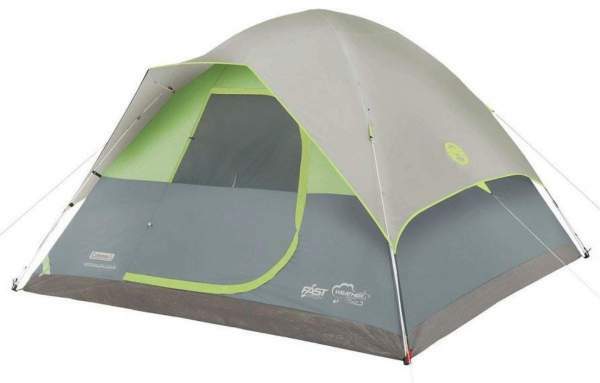 You can see it also in their Coleman Carlsbad 6, Coleman Tenaya Lake 6, and 8, and in Coleman Steel Creek 6 tents. The meaning of this is that the poles are permanently attached to the central hub. So you have a shock-corded structure where the poles converge to one single point and they are fixed there. This makes the setup easier and faster. Some manufacturers call this just the hubbed system. But there are a few more details, like clips and corner rings for poles, they all together make what they call the fast-pitch system, you will see them in the video below. 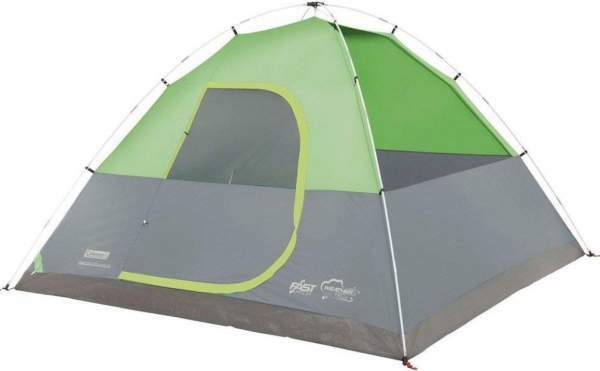 This is also a dome-style and freestanding tent with a partial-coverage fly. As a dome, it is a simple structure and the fact that it is freestanding allows you to pitch it on any surface, regardless if this is concrete, rock, or grass. The fly is attached to the corners, so you can move the tent around even when the fly is on. The partial coverage implies several things – you have no vestibules for the storage area which is not so great, but you have some views around because of a small front awning, and this makes the tent rather pleasant; it looks really cool to me. But such a minimal fly also implies less protection. Space-wise, you have 70 ft² (6.5 m²), and the declared capacity is 5 people. This implies 14 ft² (1.3 m²) per person, so they have used the backpacking principle for the tent capacity. The dimensions are 120 x 84 inches (305 x 213 cm), so imagine you should have to put 5 pads side by side, which gives 60 cm per person. With such a dome shape and low and angled walls and having no storage area, this makes the declared capacity totally unrealistic. It can work if you are at a music festival or any similar activity and use the tent only to sleep. But for a real camping, this is a tent for couples. They claim it can accommodate two queen size beds, but you would not have an inch of space left. Seasons-wise, this is a summer camping tent for dry areas. It is with a partial coverage fly and they do not provide any specific information about the waterproofness of the material. There is only a statement that it is “33% more water resistant than previous dome tents”, which makes no sense to me. Oh yes, I have also seen the statement that it is “up to 75% more water resistant”, so if you are confused then we have something in common. Climate-wise, the tent is for a warm weather camping and for a quiet environment. There are large mesh sections so this is fine when you need lots of air circulation, but less fine if it is cold outside. The dome shape is aerodynamic and in principle, this tent should perform well, but such an awning would not perform well in strong winds. Weight-wise, the tent is lightweight when you compare it with some of its competitors, you will see more in the comparison table below. It weighs 13 lb (5.9 kg), so although portable it is best to transport it by any means. The packed size is good, it packs to 23 x 8 inches (58 x 20 cm) so you can transport it even on a bicycle. They provide very little information about this tent and this is very disappointing. But the poles are fiberglass, I guess you would not expect anything else with such a price. This is a heavy material and not very durable, it needs some care to avoid damages. There is one extra pole which goes above the door where you have a small brim. Regarding the fabric, you can only guess what they use. There is a statement about “polyguard fabric and patented floor design”, so again, they show little concern for their customers with such a careless description. This is a shame really for such a big brand. But I know that this patented floor means welded seams and the floor is probably polyethylene so no doubt you will be safe from the ground. Anyhow, this is a single-room structure with a single door with a mesh on the upper section, so you can use it as a window. There are no vents, but you do not need them because the fly is high above the ground and you will have enough air flow under it. You also have two large mesh sections on the sides for ventilation purposes. There is only a couple of very small pockets and the tent is also with an electric cable port. Weight: 13 lb (5.9 kg). Dimensions: 120 x 84 in; 10 x 7 ft (305 x 213 cm). Area: 70 ft² (6.5 m²). Peak height: 64 in (163 cm). Packed size (L x D): 23 x 8 in (58 x 20 cm). In the table below I give this Namakan 5 tent side by side with two others built in the same dome style with small awnings. You realize it is smaller both by the area and by the height, and this is why its packed size is also smaller. So to summarize this Coleman Namakan Fast-Pitch Dome Tent 5 Person review, the tent looks nice and this is a user-friendly design with an easy setup. But the declared capacity simply makes no sense, and the lack of details in the description of this tent is truly disappointing. At least they give the price, and it is such that this tent looks like a nice choice if you need it for occasional summertime use and for stable weather conditions. Thank you for reading. If you would like to see more options for 5 people, please check this list of 5-person tents. For any larger tent just look around, this site is all about tents. Check for example this Browning Camping Hawthorne 6 Person Tent built in the same style. Please use the comment box below in the case of questions and comments. Have a nice day. Hi JV, great article! I was just looking for around the net for a bigger tent than what I have right now. This 5 person tent is just right for me. Very informative, thanks for sharing! Most welcome Mia and thank you for the kind words.